As if he isn't conscious of the people's absolute hate towards him, businessman and US presidential candidate Donald Trump just had to engage the Twitterverse in a Q&A sesh. 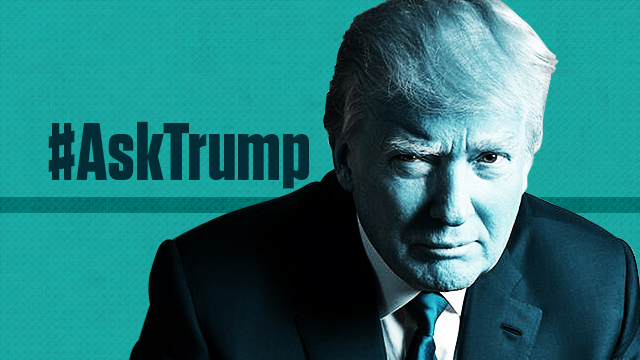 On Monday, the embattled politician opened himself up for queries using the hashtag #AskTrump, perhaps in hopes of warming up to the electorate. We're calling it (virtual) social suicide. While there were some who asked about his platform, which Trump even answered through video, the session still ended up with him drawing a helping of ribbing from tweeps. #AskTrump do you hate Mexicans because most of us have that natural tan glow and you can't achieve that without looking like an orange? #AskTrump when you "deport all immigrants" where will your wife be going? #asktrump As the head of Slytherin do you feel your association to Voldemort will hinder your chances at becoming the muggle president? #AskTrump Is Jon Snow alive? We think this serves as a nice warning to obnoxious local politicos.